The Alagnak River is another very popular fly fishing destination in Alaska. People come to the various rivers from all over the world to float the river, fish Alaska, and catch the large Salmon that run these rivers each year. The Fly fishing can be amazing during these runs, and the season is short so you need to plan your trip early while fly fishing guides are still available and the lodges still have accommodations available. The fly fishing for trout on the Alagnak River is some of the best in Alaska and in the world. The prime season is June – September. It is not uncommon to have over 4 million Salmon return each year to spawn, providing these huge trout a great food supply. 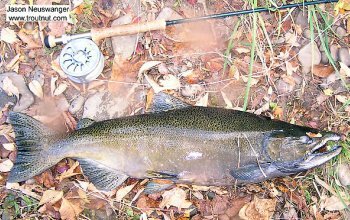 The Alagnak River is a great river to fish whether you are after large Trout or a variety of Salmon. The Nonvianuk and Kukaklek Rivers come together to form this great trout fishing river. The fish will gobble up dry flies, streamers and during the Salmon runs they will attach egg patterns and bead stringers. As far as Salmon this great river gets more than its fair share of each species. The Salmon season starts near the end of June with Kings and Sockeye returning to the river. Chums will return in the middle of July, followed by Pinks and then finally the Coho around the end of August and remaining through mid September. Leave the Alagnak River and see what else is available in Alaska.